The Republic of Ghana celebrates its Independence Day on March 6. On this day in 1957, Ghana proclaimed its independence from the United Kingdom, becoming the first sub-Saharan African country to split from the British colonial empire. 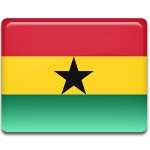 The holiday is considered to be the national day of Ghana. During the Middle Ages, the area of present-day Ghana was home to a number of powerful kingdoms such as the Ashanti Empire and the Kingdom of Dagbon. The first Europeans to make contact with the locals were the Portuguese people who came to Western Africa in the 15th century. They established a colony named the Portuguese Gold Coast which focused on gold mining and trade. Eventually, Dutch, Swedish, Dano-Norwegian, and German merchants joined the Portuguese and established their own colonies in the Gold Coast region. All of them wanted to seize power over the region because of the petroleum, natural gas, and gold deposits. The British Empire was drawn to the Gold Coast in the early 19th century. Its attempts to establish control over the coast led to a series of wars with the Ashanti Empire that wanted the territories for itself. The tribes that inhabited the coast sided with the British against Ashanti incursions. In total, there were five Anglo-Ashanti Wars. After the final war, known as the War of the Golden Stool, the British established a colony incorporating the entire territory of the Gold Coast. In addition to gold, the British exploited and exported other goods including cocoa, grain, pepper, timber, ivory, diamonds, and metal ores. They put much effort into developing the colony’s transport infrastructure as well as building schools and hospitals. The Second World War significantly weakened the colonial powers, kicking off the decolonization process, as the native population of many colonies demanded more autonomy. In 1947, J. B. Danquah founded the United Gold Coast Convention (UGCC), a political party aiming to achieve Ghanaian independence from Britain/ The party’s leaders – Ebenezer Ako-Adjei, Edward Akufo-Addo, J. B. Danquah, Kwame Nkrumah, Emmanuel Obetsebi-Lamptey and William Ofori Atta – are referred to as the Big Six and considered to be the founding fathers of Ghana. Four years later, legislative elections were held for the first time in the Gold Coast. It was the first election to be held in Africa under universal suffrage. It was won by Convention People’s Party led by Kwame Nkrumah, who had split from the UGCC. He became the first prime minister of the Gold Coast in 1952. On August 3, 1956, the newly elected Legislative Assembly voted for the independence of the Gold Coast under the name Ghana, effective March 6, 1957. The anniversary of the country’s independence is now celebrated as Ghana’s national day. Ghana Independence Day is celebrated nationwide with a range of festivities, including speeches, concerts, festivals, street parties, and more. The highlight of the holiday is a large-scale parade that takes place in Black Star Square, also known as Independence Square, in the national capital of Accra. If Independence Day falls on a weekend, the following Monday is declared a day off.